A six time world record holder and an expert in feats of strength, JD has traveled the world motivating and encouraging people of all ages in churches and school assembly programs. He has the privilege of leading and witnessing thousands give their heart to Christ. He has spoken in over 1,000 school assembly programs motivating students to hold on to their goal and dreams and to simply be the best they can be in life. His amazing speed and power allow him to perform feats of strength such as running through walls of ice head and shoulders first, bending steel bars in his teeth, ripping license plates in his teeth, rolling up frying pans in his bare hands, shredding phone books in half, bending solid steel horse shoes in his bare hands, ripping decks of cards in half in his teeth, breaking baseball bats in half. JD also holds the Guinness World record for "The Most Ice Blocks Broken By A Human Battering Ram." His TV appearances include "The Daily Show with John Stewart" ( Comedy Central), "Guinness World Records Gone Wild" (TruTV), Simon Cowell's "Red or Black" (London, England), "The Tonight Show with Jay Leno" (NBC) "The People's Award 2013" (Tokyo, Japan), as well as "Americas Got Talent" (Season 9), as well as Guinness World Records (Milan, Italy). Putting his body on the line for the entertainment of others, JD is known around the world as "The Iceman." J.D. on America's Got Talent! 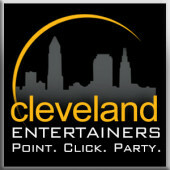 Check Back often for Cleveland Entertainers next featured act!